Weekly Head Voices #168: Postcards from the edge. Sometimes it feels like the place is falling apart, and sometimes you find yourself in a heavenly corner like this. 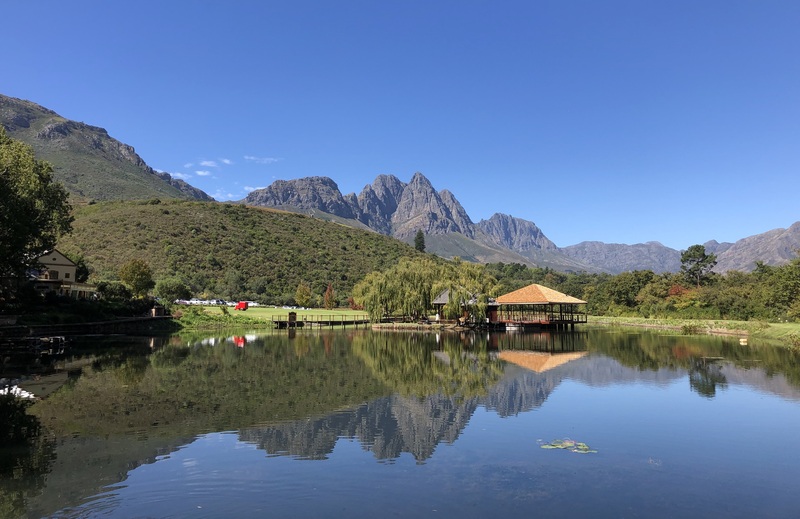 Postcard Café, Jonkershoek, Stellenbosch. In this edition of the WHV, I cast my now older eyes back on the week starting on Monday, April 1 and ending on Sunday, April 7, 2019. I have to apologise for the extremely high nerd content. There will be wine at the end to make up for it! Working late like it’s 1998. At the start of the week, I had resolved to get more sleep. It seems that when I have a good night’s sleep, really working that glymphatic system (I’m currently fascinated by the glymphatic system, I hope you like it too), amongst other nightly repair activities, there is a greater probability that I am able to hold my focus the next day. At least that was the case until Wednesday, when I decided that the time had come to port vxlabs, the far more nerdy sister of this blog, from wordpress to hugo as well. One thing led to another, and by 1:00AM (on a school night no less!) I was busy wrapping up the isso commenting system configuration. One of the many funny things about being a nerd, is that it’s almost impossible to go to bed before a technical thing like this has been convincingly put to bed. Fortunately this late night indiscretion yielded a working self-hosted commenting system, and, far more importantly, a rather attractively styled post, thanks to the Hugo-port, detailing the whole installation. In entirely predictable fashion, the next day was not the best focus-wise. DSP lab, somewhen between 97 - 99. I chose Isso because it’s Python. DayJob™ is all about Python, so this was a great choice in terms of time savings. With all of the time I had saved, I decided that I would experiment with re-implementing parts of Isso in f#, my current hobby functional language. Setting aside the irony here, I learned after some time that getting f#, the impressive looking SQLProvider and sqlite (isso’s database) all working together on Linux was “probably the single most complicated thing that you can do with a F# project, when it comes to tooling”. In this case, I was thankfully able to switch gears and did a brief review of possible candidates for a functional(ish), memory efficient, fast(ish) compilation languages that could be used to implement an Isso web-service replacement. Somehow I ended up with nim. This has been on my radar for a while now, but there were always shinier things to try. I think what might have put me off was the similarity to Python. So, with the rest of the time I had saved choosing Isso, I got up to speed(ish) with nim by starting to implement a replacement for parts of the isso commenting system. Compilation speed: The nim compiler transforms my webservice code into C and then compiles that in about 1.2 seconds. Performance and memory size of resultant binary: This is not a fair comparison to Python, but the multi-threaded nim service consumes a few megabytes in total. Availability of packages especially for building a web service like this: Using the nimble package manager, I could install jester and had my first running web-service in a few minutes. Real macros: I used the list comprehension one in the sugar module. This was really just an exercise (for now), but I have a new tool for whenever I need to write a fast and compact compiled web-service again! P.S. Learning new programming languages is one of my favourite things. P.P.S. Thanks to the internet and open source, and especially tools like github, we are currently going through a sort of programming language Cambrian explosion. See this Fledgling Languages List for example. Pony! On Sunday, we made the drive out to Jonkershoek in Stellenbosch. Even although it’s only 40 minutes away, I haven’t been there in far too long. It’s a truly beautiful corner of the planet. At the Postcard Café, after some internal deliberation, I made the decision that the moment was special enough to interrupt LAZ (lifestyle-alcohol-zero™) with an all the more special glass of the Stark-Condé Field Blend white wine. This is a hyper-local blend of Chenin Blanc, Rousanne, Verdelho and Viognier, all four varietals which grow on the mountain-side right across from the Café’s veranda. < Weekly Head Voices #169: A cunning plan. Related posts: 🌤 Weekly Head Voices #167: Yes, and... 🌤 The 2018 to 2019 transition post. 🌤 Weekly Head Voices #157: Melodramatic.